Sweet tea + Lemonade is a classic southern mocktail known as the "Arnold Palmer." Delicious, light, and refreshing, this is a great drink to enjoy sitting on the porch in the summer. Imagine my excitement when I saw this as a dessert when Joey and I were out to dinner one night. 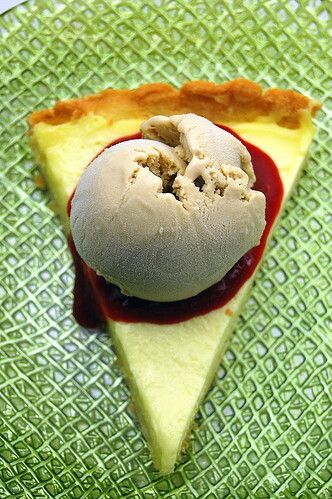 This playful dessert was a lemon tart topped with Firefly ice cream. What's Firefly, you ask? It is sweet tea flavored vodka - genius! My favorite way to enjoy it is to mix it with raspberry lemonade over ice. Some friends of mine call firefly with lemonade the John Daly Special, but my best friend calls the raspberry lemonade version a "Southern Belle." And that's much cuter and sweeter, don't you think? Anyway, on to the dessert. I used Dorie's Most Extraordinary Lemon Tart for the tart. The ice cream was kind of an experiment, but I think it turned out well. I also whipped up a raspberry coulis to serve alongside. This is such a fun dessert, and would be well received at a party. Bridget has a great write-up on the tart, so I'm just going to link over to her - plus she takes the best pictures! Combine the milk, 1/2 cup sugar, and 1 cup of cream in a medium saucepan. Heat to dissolve sugar, stirring constantly. Remove from heat, and add tea bag to milk mixture. Cover and allow to steep for 1 hour, stirring occasionaly, and pressing down on bag to extract as much tea as possible. In a medium bowl, beat the egg yolks and sugar until light and fluffy. Return cream mixture to stove and mix in remaining cup of heavy cream. Heat until lightly simmering, then pour into egg mixture. Stir to combine, and return to heat. Cook over medium-low heat until the custard thickens and coats the back of a spoon, stirring constantly, about 7-12 minutes. Pour through a fine-mesh seive into a medium bowl, and cover with plastic wrap, pressing down onto the surface of the custard. Mix in vodka, vanilla, and lemon juice. Allow to chill completely. Follow ice cream maker's instructions to churn ice cream. Freeze overnight for best results. The ice cream will never be completely frozen due to the high volume of alcohol, but mine got to be somewhere between soft serve and traditional ice cream. To serve, slice tart into wedges, and top with ice cream. 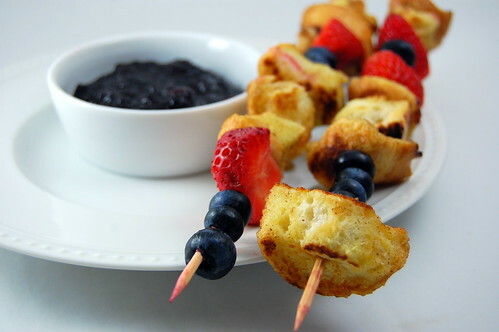 Serve with raspberry sauce on the side and fresh berries. While normally I would say that I'm not a huge fan of casseroles, this one wins a thumbs up from me. Cans of cream of whatever soup, overcooked meat, mushy noodles, tons of cheese (ok well that part does sound good to me)... just not my thing. I actually made this for my brother-in-law and mom when I was visiting my sister when she had surgery earlier in the month. I made it again for Joey this week, and he was a huge fan as well. Supposedly it serves 2, but I really think it makes enough for 3, even 4, especially if you also serve a salad or some rice and beans. I love that it uses tortilla chips, and cooks them in batches. The first half goes in with some chicken broth and chicken while it cooks; the remainder is then mixed in and remains nice and crispy. I like to use the multigrain chips because I think they have more flavor and texture. Another hit from Cook's Illustrated, and another use for my new favorite, chipotle peppers. Heat the broiler and adjust rack to about 6 inches from heating source. Pat the chicken dry and season with salt and pepper. Heat 1 Tablespoon of oil in a 10-inch oven safe skillet over medium-high heat until smoking. Add the chicken and cook on both sides until golden-brown, 5-7 minutes total. Transfer to a plate and set aside. Add the remaining oil, shallot, garlic, chipotle, and 1/4 teaspoon of salt, and cook until fragrant, about 30 seconds. Add broth and scrape of browned bits, and bring to a simmer. Stir in half the tortilla chips. Nestle the chicken into the broth and cook over medium low heat until cooked through (reading 160 on a thermometer), about 10-15 minutes. Transfer to a cutting board, and when cool enough to handle, shred into bite-sized pieces. 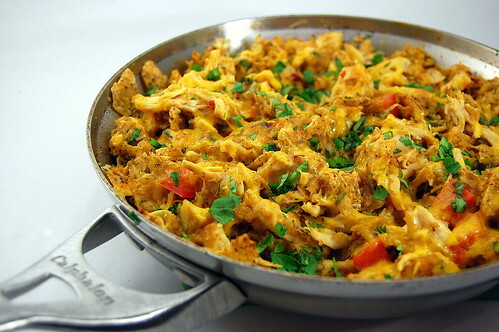 Return the shredded chicken to the skillet with the tomato, 1/2 cup cheese, and 1 Tablespoon of the cilantro. Stir in the other half of the tortilla chips until they are incorporated and moistened. Sprinkle the remaining cheese on top and broil until the cheese is melted and browning, 2-3 minutes. Top with remaining cilantro and serve, allowing casserole to cool 5 minutes. I am always looking for fun new ways of using ingredients. I also really love bruschetta, so when I saw this recipe in Cook's Illustrated, I knew it was right up my alley. Like I've said, I'm furiously trying to make as many recipes as I can using my favorite summer produce, so this appetizer was perfect for a "farewell to summer (for real this time)" dinner last weekend. The recipe originally called for the squash and zucchini to be cut into matchbook-sized pieces, but I thought it'd be easier to shred and drain as I have done in the past. The blue cheese adds a nice richness and tang, and the bacon... well, everything's better with bacon, right? (unless you're Mattin, that is. Top Chef anyone)? I added the draining step for the squash and zucchini, because when I made this, I felt like I had a lot of water in the bottom of the bowl. One final note, this recipe makes enough for 4 meal-sized servings. I adapted it to appetizer size by using a smaller baguette. Fry bacon in a small skillet until crisp, and drain on paper towels. Combine squash and zucchini, red wine vinegar, oil, 1/4 teaspoon salt, and pepper in a medium bowl. Set stand 5 minutes, then stir in bacon, blue cheese, and basil. Adjust oven rack about 4 inches from heating source and heat broiler. Broil bread slices until golden brown on both sdies. Brush both sides with oil and rub with garlic clove. Divide mixture evenly among bread slices; broil until cheese begins to melt, about 1-2 minutes. Serve immediately. So it seems as though Caroline has inherited her mommy's sweet tooth. She goes absolutely nuts for ice cream, cake... really any dessert that she's tried she has loved. I don't mind her having the occasional treat, but I like to keep things healthy for the most part. Luckily she also loves bananas, zucchini, blueberries, butternut squash, peas, black beans, and other fruits and veggies. My mother-in-law gave me the controversial Jessica Seinfeld cookbook for Christmas a few years ago, and this is the first recipe I've tried out of it. In case you aren't familiar, the basis of her cookbook is hiding fruits and veggies in food to "trick" your kids into eating them. While I like the idea of getting in a few extra servings of fruits and veggies a day, the idea of being sneaky about it doesn't really sit right with me. I think we should learn to love them by experimenting with different ways of preparing, seasoning, and serving them. Not by hiding them in other foods. In a bowl, combine the flour, oats, baking soda, salt, and cinnamon. Whisk to combine. In a large bowl, beat the sugar and butter with a wooden spoon until just combined. Add the banana and zucchini purees and the egg white, and stir just until blended. Add the flour mixture, raisins, and stir to combine. Drop the dough by heaping tablespoons onto the baking sheets. Leave about 1 inch between each cookie. Bake until golden brown, 12-15 minutes. Allow the cookies to cool on a baking sheet for 5 minutes, then transfer to a rack to cool completely. Don't you just love meals that require little time and very few ingredients? This is one of them. And it doesn't hurt that you get to drink wine while you cook it ;-) Its elegant, comforting, and simple. I love making dishes that really allow the ingredients to shine. This is a great throw-together meal because you most likely already have these ingredients in the pantry. 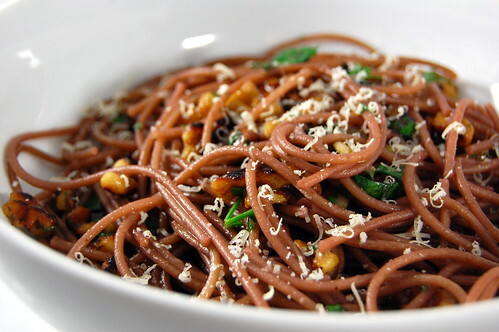 The red wine gave the spaghetti a complex flavor, and I loved the addition of toasted walnuts. And, its pretty! Heat 2 Tablespoons of olive oil in a large skillet. Add the garlic and red pepper, and season with salt. Cook over medium heat until fragrant, about 1 minute. Add the remaining 1/4 cup wine and the reserved cooking liquid and bring to a simmer. Stir in the pasta and continue cooking to absorb most of the liquid. This will take about 2 minutes. 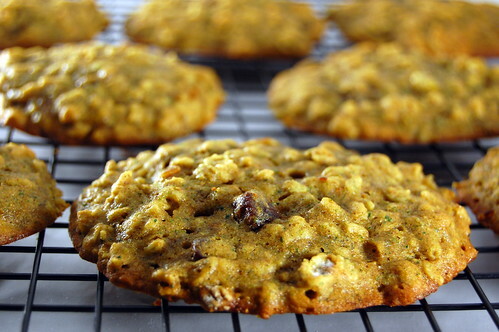 Mix in the parsley, nuts, 1/2 cup cheese, and the remaining 2 tablespoons of olive oil. Season with additional salt and pepper, and serve with additional cheese. Remember a few months ago when I promised that I'd show you something fun to do with ice cream? Well I'm finally getting around to posting this even though these little babies are long gone. Similar to dipping truffles, these are quick and relatively easy to make, but are so fun to serve. They are the perfect little bite size dessert. And the chocolate-oatmeal-raisin combo was wonderful. Of course, really... just add chocolate to anything and I'm pretty happy :-) I can think of countless ice cream flavors that would be just as tasty - strawberry, chocolate, hazelnut, raspberry, peanut butter, even plain vanilla would be classic. Just a few notes.. make sure the frozen balls of ice cream are very well frozen, and work quickly to dip them... they do melt fast. I used a medium cookie scoop (I think its about 1 Tablespoon) to form the balls, then just smoothed them out using my fingers. I only took out one ball at at time while dipping to make sure each one stayed as cold as possible and didn't melt. Line 2 dinner plates with plastic wrap or parchment paper, and put them in the frezer until they are chilled, a few hours. 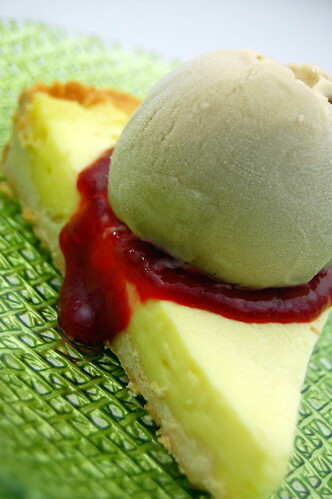 Use a scoop or Tablespoon to make balls of ice cream, setting them on one of the plates. Be sure each one is solid and well formed, with no dangling bits of ice cream, using your hands if necessary. Freeze the scoops thoroughly. When ready to dip, melt the chocolate, butter, and corn syrup in a medium bowl over simmering water (alternatively, microwave at 30 second intervals, stirring well between each time). Once the mixture is melted and smooth, remove the bowl from heat. 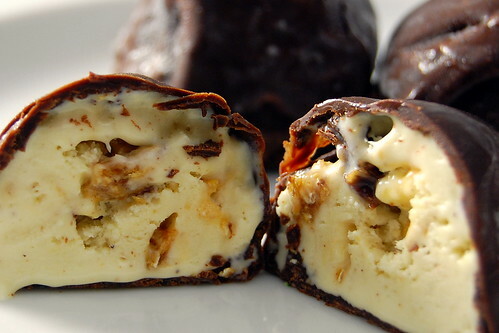 Working 1 ice cream ball at a time, dip into chocolate using 2 soup spoons. You want a thin shell of chocolate, so toss it quickly back and forth between the spoons to remove excess chocolate. Transfer to the unused dinner plate in the freezer, and repeat with remaining scoops. Freeze until ready to serve and well chilled. I honestly have never been a huge fan of creamed corn... it always seemed kind of slimy, runny... just yuck. But then I realized that its just canned creamed corn that I don't like. THIS creamed corn is out of this world. Fresh corn kernels, sauteed with scallions, butter, and garlic; mixed with some cream, then some of the corn is pureed.... mix in some cheese and cilantro, and you have an absolutely outstanding side dish. Fresh, flavorful, creamy, cheesy. The final product is really just whole corn kernels held together by the puree. It produces a wonderfully crisp, yet smooth result. And queso fresco is just great anyway. 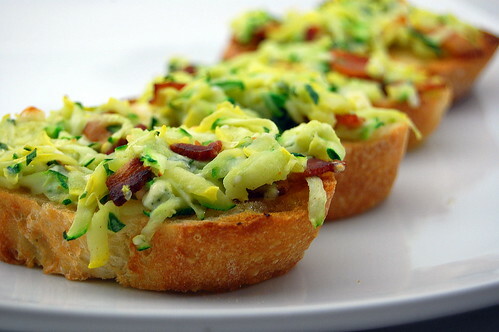 I am submitting this recipe to the LiveSTRONG with a Taste of Yellow blogging event. I don't think I need to go through and count all the people I know whose lives have been affected by cancer. I have lost grandparents, aunts and uncles, and friends to the terrible disease. Please use this as an opportunity to be tested, screened, and checked. Head over to Wino's and Foodies to read others' stories and see what yellow food they came up with. Heat butter in a deep 12-inch skillet over medium-high heat until foam subsides. Cook scallions, stirring occasionally until softened, about 5 minutes. Add the corn and 1/2 teaspoon each of salt and pepper, stirring occasionally, 5 minutes. Stir together the cream and cornstarch until thoroughly combined. Add to the corn and simmer, stirring until slightly thickened, about 3 minutes. Transfer 2 cups of the corn mixture to a blender with garlic and puree until smooth. Return to the skillet and cook, stirring constantly, until heated through. Season with additional salt and pepper to taste. 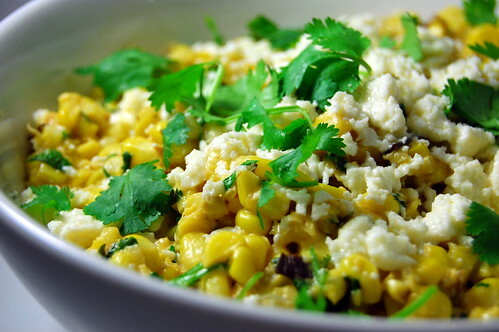 Transfer corn to a large serving bowl and mix in most of the cheese and cilantro. Sprinkle additional cheese and cilantro on top to serve. Ahhhh fall is in the air. Don't get me wrong, I'm still furiously cooking up as many recipes I can with tomatoes, corn, and zucchini, but I couldn't help myself when I saw these blondies on Cate's World Kitchen. Pumpkin and White Chocolate are two of my favorite dessert flavors, and I could smack myself for never having combined them. 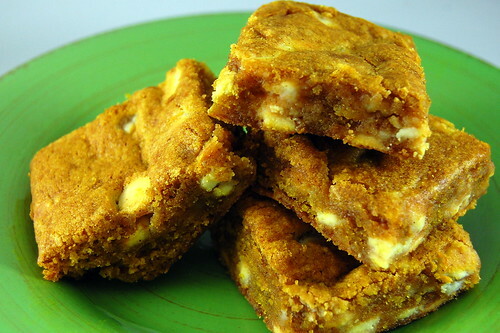 The bars taste like pumpkin pie in a blondie. The white chocolate adds just enough sweetness to compliment the spice. These blondies come together very quickly; start to finish is less than an hour... which is very dangerous, especially since I have everything I need for them and I am very tempted to whip some up right now. I made these last week, and I took some of these to Bible study, sent some to my in-laws, and served a few for dessert when we had some friends over. And can I be honest and say that I kind of wish I had kept them all for myself? Line bottom and sides of a 9-by-13-inch baking pan with foil, leaving an overhang on all sides. Spray foil and sides of pan with cooking spray. Spread batter evenly in prepared pan. Bake until edges begin to pull away from sides of pan and a toothpick inserted in center comes out with just a few moist crumbs attached, 30 to 40 minutes. Cool completely in pan. Lift cake from pan (using foil as an aid). Peel off foil, and use a serrated knife to cut into squares. Wow, I have so much that I want to say about this dish.... I have been wanting to try a mole for quite some time, and when I saw it in Cook's Illustrated, I knew had my recipe. I made it last week when my best friend and her husband came over for dinner. They come over every Wednesday night to watch Top Chef, and I usually try and make something fun for dinner. This was certainly.... interesting. 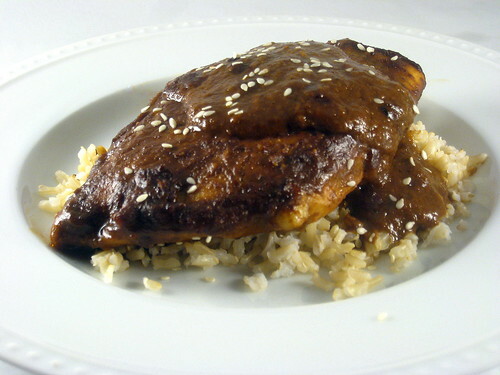 Mole sauce has a very distinct flavor, which is not surprising, considering that it contains pretty much everything in your pantry. But while the ingredient list is long, you probably keep most of this stuff on hand. I was a little nervous when I put the chicken in the oven to bake. I tasted the sauce, and it was very heavy on the peanut butter. But once it cooked some more, the peanut butter flavor was much more subtle, and you were left with lots of heat. And I really mean a lot. I am pretty much a spice wuss, but even Joey thought it was spicy....in a good way. I added a little sour cream to mine to mellow it out a bit. Who would have that that one pepper could be so spicy? I think we all enjoyed it though; Joey and Chip even split the last piece of chicken. Heat the oil in a 10-inch skillet over medium heat until shimmering. Add the onion and cook until softened, 3-5 minutes. Reduce heat to medium-low, and stir in the chili powder, chile, cinnamon, cloves, and chocolate. Stir constantly until the chocolate is melted and bubbly, about 1 minute. Stir in the garlic and cook until fragrant, about 30 seconds. Add the broth, tomato, raisins, peanut butter, and sesame seeds. Bring to a simmer and cook until the sauce is slightly thickened, stirring occasionally, 10 to 15 minutes. Transfer the sauce to a blender and process until smooth, about 30 seconds. Season with salt, pepper, and sugar to taste. Pat the chicken dry and season with salt and pepper. 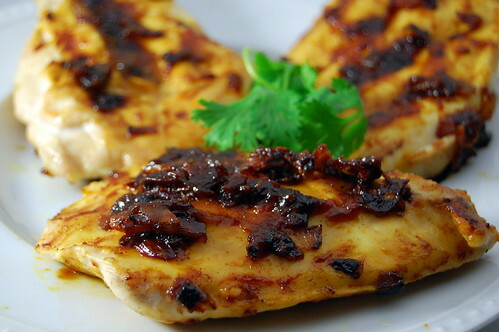 Arrange in an 8-inch baking dish, and pour the pureed sauce over the top, turning chicken to coat. Bake for 12 to 15 minutes. Flip the chicken and continue to bake until a thermometer inserted in the thickest portion reads 160-165, about 15-20 more minutes. Remove the chicken from the oven and tent loosely with foil. Allow to rest 5 to 10 minutes. Serve atop rice, with extra sauce and sesame seeds. For dessert for my end of summer dinner last week, I wanted to do something fun with pound cake. 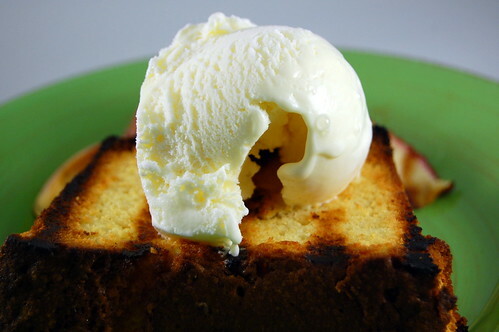 I thought it would be really yummy to throw it on the grill with some peach slices, and then top with vanilla ice cream. And it was yummy! But first, I had to make the pound cake. I turned to Ina Garten, who used inspiration from Cook's Illustrated; so of course I was convinced that this must be the best pound cake ever! The "secret ingredient" is lemon zest, and while I appreciated the lemony flavor, it definitely overpowered the honey and vanilla. 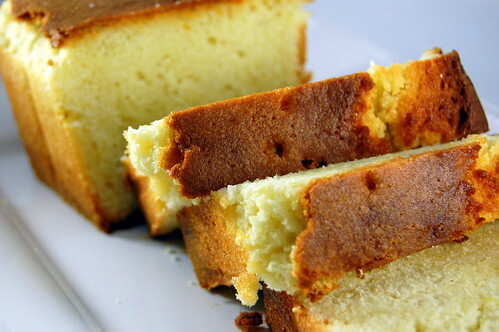 So much so that I think it would be better described as "Lemon Pound cake." I think next time I make it I would decrease the lemon zest to 1/2 teaspoon. And one final note: The recipe calls for an 8 1/2 x 4 1/2 x 2 1/2 inch loaf pan. Well I had both a 10 x 5 and an 8 x 4, and I stupidly opted for the 8x4. And of course my cake overflowed on the cookie sheet. Thank goodness at least had baked it on a cookie sheet; I would have had a huge mess to clean in the oven otherwise! So while my cake didn't turn out with a beautiful domed top, it was still plenty tasty! Preheat the oven to 350. Grease an 8 1/2 x 4 1/2 x 2 1/2 loaf pan. Line the bottom of the pan with parchment paper, then grease and flour the pan. Fit an electric mixer with the paddle attachment. Cream the butter and sugar on medium speed for 3-4 minutes, until light. meanwhile, add the eggs, honey, vanilla, and lemon zest in a glass measuring cup; but do not mix to combine. With the mixer on medium-low speed, add the egg mixture one egg at at time, scraping down the bowl between each egg, and allowing each egg to become completely incorporated before addng the next. Sift together the flour, salt, and baking powder. Add slowly, with the mixer on low speed, until just combined. Do not overmix. Finish mixing the batter with a rubber spatula and pour into the prepared pan. Smooth the top, and bake on a cookie sheet, for 50-60 minutes, or until a toothpick comes out clean. Now that summer is coming to an end, I am trying my darndest to squeeze in as many meals using as much beautiful summer produce as I can. This recipe was in the September issue of Food and Wine, and it was part of an article highlighting cooking with wine. Well, I love wine, I love cooking, and I really love cooking with wine! 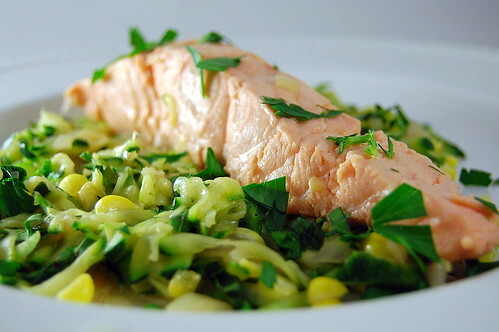 Poaching the salmon really gives it a nice and delicate flavor, and combined with the sauteed corn and zucchini, this was a light but filling summer dinner. The white-wine butter sauce was a little too buttery (I never knew there was such a thing! ), so I have decreased the amount below. The dish also presents beautifully and looks elegant; it would be perfect for entertaining. Set a colander over a bowl. Add the zucchini and toss with 1 teaspoon salt. Let stand for 20 minutes, tossing occasionally. Squeeze zucchini dry in a paper towel. In a large skillet, heat the olive oil. Add the chopped shallots and season with salt and pepper. Cook over medium heat until softened, 2-3 minutes. Stir in the corn and 1/2 cup of water. Cover and cook until the corn is tender, about 4 minutes. Stir in the zucchini and 1/4 cup of wine, and cook until heated through, about 2 minutes. Season with salt and pepper and set aside to keep warm. In a large saucepan, combine 2 cups of the wine with the thyme, bay leaf, the halved shallot, and 2 cups of water. Bring to a simmer. Meanwhile, season the salmon with salt and pepper. Add the fillets to the saucepan, and cook at a low simmer over low heat, and cook about 6 minutes, or until cooked through, turning once. Carefully remove from the poaching liquid and transfer the salmon to a plate. Pat dry with a paper towel, and discard the liquid. Add the remaining 1/2 cup of wine to the saucepan and bring to a simmer. Whisk in the butter one tablespoon at a time, until thoroughly incorporated. Season with salt. Stir the basil into the vegetables and divide evenly among four plates. Nestle the salmon into the vegetables, top with butter sauce, and serve. 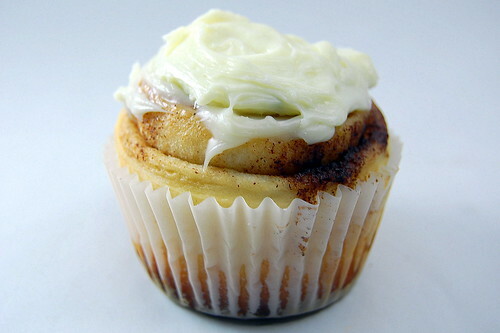 These cinnamon roll cupcakes are just too cute! I took them to an early morning tailgate, and it was a great way to enjoy cinnamon rolls without the mess. In the interest of full disclosure, I wasn't entirely happy with how they turned out, but it was all my own error. We were out at an alumni function Friday night, soI didn't start these until after 10pm Friday night; needless to say I was already really really tired... so I'm afraid I was just a little careless. I feel like I should have kneaded it by hand a few times before the first rise, because it was very very slow to rise. I actually stopped it about 45 minutes in, kneaded it a few times, then put it back... and miraculously, it rose! I then refrigerated the finished rolls overnight in lieu of the final rise, which was fine, but they actually didn't rise until they were in the oven. And finally, I overbaked them by about a minute. I thought they were a little dried out because of this, but my friends still enjoyed them! Dissolve the yeast and 1/4 cup of the granulated sugar in the warm milk in a large bowl and let stand for about 10 minutes until foamy. Mix in the eggs, butter, salt, and other 1/4 cup of granulated sugar. Add flour and mix until well blended and the dough forms a ball. Turn out onto a lightly floured surface, and knead about 5-10 times. Place in an oiled bowl, cover and let rise in a warm place until doubled in size (about one hour). After the dough has doubled in size, turn it out onto a lightly floured surface, cover and let rest for 10 minutes. In a small bowl, combine brown sugar and cinnamon. Line cupcake pan with cupcake liners, and lightly spray over the top of them with cooking spray. Roll dough into a 12x22 inch rectangle. Spread dough with 1/3 cup butter and sprinkle evenly with sugar/cinnamon mixture. Roll up dough and cut into 24 rolls using dental floss or a pastry cutter. You may have to unroll each roll and re-roll in order for the dough to fit in a cupcake tin. Place each roll in a cupcake liner. Cover and let rise until nearly doubled, about 30 minutes. Alternatively, allow to rise overnight in the refrigerator. Meanwhile, preheat oven to 400 degrees Fahrenheit. Bake rolls in preheated oven until golden brown, about 10-12 minutes. Let rolls cool completely before frosting. To make the frosting, mix cream cheese and butter using the whisk attachment of a mixer. Slowly add the powdered sugar until desired consistency has been reached. Last year around Christmas, Joey's parents bought half of a cow. Yes, half of a cow. They of course had it butchered, and then we split it between us, them, and Joey's sister. So needless to say, we have quite a plethora of beef. The majority of it is ground beef, which yields the best burgers ever, but we also got plenty of great steaks. I used some filets to make this dish. Since I was out of town all of last week, I didn't get a chance to harvest or cook with any of my tomatoes, so I had several that were ripe and ready to go. I used them in this tomato jam, and man was it good. I think it would also be tasty on grilled chicken or pork as well. 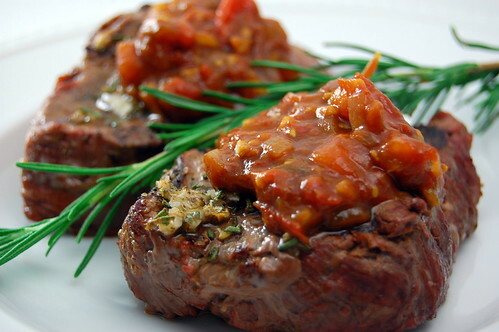 The garlic and rosemary add a nice, woodsy flavor to the beef, and the tomato jam is slightly sweet. My neighbors have a huge rosemary bush, and we trade rosemary for oregano and basil from my garden... so this meal was virtually free! Prepare grill to medium-high heat. Season steaks with salt and pepper. In a small nonstick skillet, heat oil over medium heat. Add shallots to pan and cook 3 minutes, stirring occasionally, or until softened. Stir in 1 of the minced garlic cloves, and stir, cooking until fragrant, about 30 seconds. Add tomato, water, vinegar, and 1/8 teaspoon of salt. Bring to a boil. Reduce heat and simmer 12 minutes, or until the liquid has almost all evaporated. Stir in 1/8 teaspoon of pepper and set aside. Combine remaining garlic, 1/8 tespoon pepper, rosemary, and 1/4 teaspoon of salt in a small bowl. Oil grates of the grill using a paper towel held with tongs. Grill steaks for 3 minutes; turn over. Sprinkle evenly with garlic and rosemary mixture, and continue to grill an additional 3-4 minutes, or until desired degree of doneness. Remove from grill, and allow to rest under foil for at least 5 minutes. Top with 2 Tablespoons of tomato jam to serve. This salad is like a southerner's version of panzanella. Cornbread replaces the loaf of french bread or ciabatta, buttermilk dressing replaces the vinaigrette, and throw in some tomatoes and vidalias to call it a day. Absolutely delicious. I served this as a side to some grilled steaks, but it was certainly hearty enough to stand alone as a main course. Deb over at Smitten Kitchen says that if you take this to a potluck (and you should, I agree), then take the components seperately and then just toss them together before serving. This will keep you from serving mushy cornbread and lettuce. This is actually even ideal for entertaining or potluck-ing because all the components can be prepared hours in advance, and its just sitting there waiting to be tossed and served. I don't ever seem to find any big beautiful heirlooms unless I'm at the farmers' market or Whole Foods, but my Trader Joe's does have mini heirlooms mix. So I used a 1-pound pack of those, and then threw in 2 vine-ripe tomatoes. I also threw in half of a hothouse cucumber, sliced very thinly. The buttermilk dressing is very thin, but very flavorful and herbaceous! Hurry up and make this, before all the good tomatoes are gone! Preheat the oven to 250. Cut the cornbread into 1-inch cubes and lay in a single layer on a baking sheet. Bake for 5-10 minutes, until toasted and crisp. 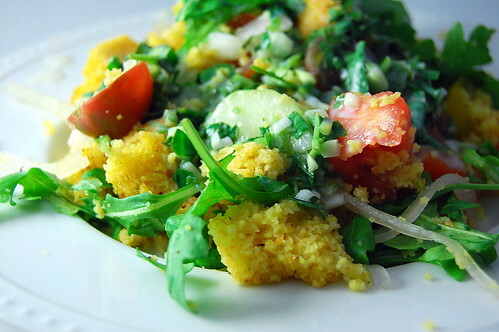 Combine the tomatoes, cucumber, onion, and arugula, and 3 cups of the cornbread in a large bowl. Toss to combine. Drizzle dressing over mixture, toss again, and season with additional salt and pepper if necessary. Whisk all ingredients together in a small mixing bowl. Set aside, or refrigerate, covered, for later use. Preheat oven to 450. Place 1 tablespoon butter in a 12-inch oven safe skillet, and place the skillet in the oven while it preheats. Sift together the cornmeal, baking powder, baking soda, salt, and sugar in a large mixing bowl. In a separate bowl, whisk the egg until frothy. Whisk in the buttermilk. Combine the wet and dry ingredients, and stir to combine well. Melt remaining 2 Tablespoons of butter, and add to mixture. Remove skillet from the oven, and swirl to allow the butter to coat the pan. Pour the cornbread mixture into the skillet (and listen for it to "sizzle alluringly" according to the Lee Brothers - it did)! Cook for 10-12 minutes, until golden brown, and the edges pull away from the skillet. Allow to cool completely, then cut into wedges to serve, or cubes for salad. First of all, I'd like to apologize for my brief hiatus. I was visiting my sister out of town, and while I was cooking up a storm, I wasn't taking pictures, nor did I really have the time or energy to blog. She had her gallbladder removed last week, and I went to visit and try and nurse her back to health. She is recovering nicely, with a freezer and fridge full of food, and Caroline loved playing with all her cousin's fun toys. Anyway, I had initially planned to schedule some postings in my absence, but I just never got around to it before I left. In any case, I made these cute little kabobs for Georgia Tech's home opener on Saturday. They were fun to make, and even more so to eat! The blueberry sauce was lovely, but these could certainly be eaten with regular syrup or even plain! These little puppies are insanely addicting, and were perfect for our brunch-themed tailgate. They would also be great to serve at a shower to large crowd at brunch. Lay the bread cubes in a single layer on a cookie sheet. Toast 5-10 minutes, or until crisp but not browned. Alternatively, allow them to sit overnight. Whisk together the eggs, milk, buttermilk, vanilla, and salt. Gently toss the bread cubes in the egg mixture. Melt butter in a large nonstick skillet. Cook the bread cubes, in batches, turning to brown each side of the bread. Set aside on a large cookie sheet. Meanwhile, mix the cinnamon and sugar in a small bowl. Toss the french toast bites with the cinnamon/sugar mixture. 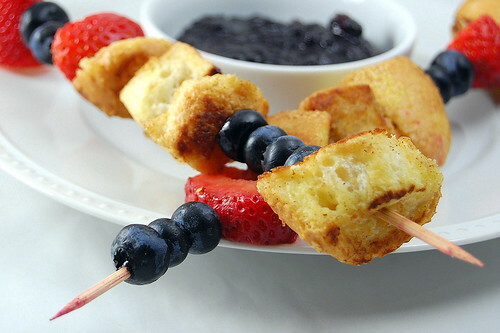 Thread onto skewers, alternating with fruit (I used blueberries and strawberries). Serve with blueberry sauce. To make the blueberry sauce, combine the blueberries and syrup in a small saucepan. Bring to a boil, and cook, stirring continuously. Serve with kabobs.